What separates good global Web sites from great global Web sites? Is it just the number of languages a Web site supports? Certainly languages are essential. Although every Web site is global by nature, few Web sites support enough languages to be understood by the majority of the world’s Internet users. But translation is just one aspect of a successful global Web site. As the practice of Web globalization has become mainstream, so too have a number of best practices. In an effort to identify and understand these established and emerging best practices, in 2003, I began benchmarking the Web sites of hundreds of global companies and organizations. I tracked language use, navigation techniques, and global consistency, and interviewed hundreds of executives who manage these global Web sites. This information formed the basis for The Web Globalization Report Card of which the 2007 edition was recently published. This article lists the top 10 Web sites from the report and explains some of the best practices that these Web sites have in common. Google has made itself at home at the top of this list for the past few years. The reason Google excels is not just due to its 115-language search interface. Google has also rapidly localized its many Web-based applications — from Blogger to Adwords — in up to 40 languages. Wikipedia can lay claim to being the most global Web site on the Internet, offering content in more than 250 languages. Wikipedia proves that you don’t need to be a big corporation to create a wildly successful global Web site; you do, however, need a few thousand very motivated volunteers. Cisco Systems and Philips both improved their global navigation over the past year, improving their scores. Microsoft recently added a Spanish site for the US market, bringing the number of languages it supports to 40. And American Express supports 29 languages, more than any other financial services company; within the past year, the company added localized sites for Romania and Slovenia. Although the Web sites on the list reflect a wide range of industries and audience types, you will find they have a number things in common related to Web globalization. What Makes a Great Global Web Site? Languages: To reach 80% of the world’s Internet users, you must support at least 10 languages. The best Web sites support many more. Localization: Not only is depth of localized content essential to success, but so is the localization of elements such as search engines, promotions, icons, and photos. Global Navigation: Users must be able to find their local Web sites even if they don’t speak English. Global Consistency: Global design templates not only support the global brand, they are quite simply a lot easier to manage internally. It wasn’t very long ago that you could call your Web site global when it supported FIGS (French, Italian, German, Spanish) and Japanese. But rising Internet penetration, the globalization of business, and higher user expectations have given rise to the 30+ language Web site. Based on the Report Card, the average number of languages supported by the 200 Web sites studied is 18 — a 23% increase from 2006. By this time next year the average could very well surpass 20 languages. Web localization typically evolves in stages. First, the marketing folks have their way at creating localized Web sites. These mini-sites typically function like brochures — promoting the newest products and services and saying a bit about the company. The danger with this approach is that the localized Web sites may create the impression that the entire Web sites have been translated, resulting in disappointed users. However, if Web sites are transparent about what they content they support and do not support — the sites have proven to be a positive step forward in Web localization. This is a smart strategy because it gives the user a sense of control and also gives bi-lingual users access to all available information, instead of having to jump back and forth between the US and French Web sites. Rarely do companies translate all of their content for all markets they serve — the costs are simply too high. The emergence of machine translation will certainly help companies fill in these content gaps, but this too will take time. Until then, a tiered approach to Web localization is the way most companies proceed. A tiered approach to Web localization aligns resources with potential returns. Managing internal as well as external expectations. It also allows a company to get into a market quickly without risking too much upfront. Provided the Web site does not create the impression that there is more content beneath the marketing facade, these sites can be successful. Companies may use them to test market demand, generate leads for the local sales team, or simply to appease the local sales offices. Ultimately, companies will need to spend real money on translating lots of content and localizing the applications that consumers want. And this is where the real work begins. For example, consider the localized room reservation engine at Starwood Hotels. Shown here, you can see a few details that must be addressed in the localization of this application — such as text expansion from English to German and date formats. The localization of reservation engines, search engines, shopping carts, and order tracking engines are where the best localized sites distance themselves from the competition. Localized Web sites are of little value if the Web user cannot find them. Many global companies find that more than half of the traffic to their .com sites originates from outside of their home market. The challenge then becomes one of directing these Web users to their local sites — something that is easier said than done. The splash global gateway and permanent global gateway are illustrated here. The splash gateway is a valuable device for ensuring that first-time visitors select their locale before they have a chance to get lost. On each country site is a permanent gateway icon that links back to the splash page so Web users can change locale settings at any time. Nearly 30% of the 200 Web sites studied now deploy splash global gateway pages to direct Web users to local content. At this rate of growth, I expect the number of Web sites using splash gateways to surpass 50% by the end of 2008. What’s the reason for this increase? 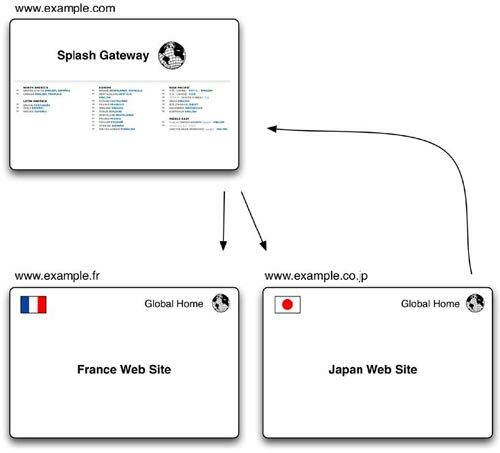 For starters, a splash global gateway, properly executed, is an excellent navigation tool. Second, as more companies begin supporting 20+ or 30+ country Web sites, they find they cannot get by simply using a pull-down menu. A splash global gateway is not for everyone. Google, for one, does not use one. However, it does use geolocation and language negotiation to detect the user’s language preference and location so it may seamlessly take the user to a specific localized site. Flags should not be used to indicate language. Language and country names should be presented in their native language and script. Companies should not show favoritism for any country over another. Companies often don’t enter Web globalization thinking that they’ll one day be supporting 100+ local Web sites. As a result, they often do not think about how to develop Web templates that can scale quickly to accommodate many localized sites while remaining easy to manage. It’s much easier to train your global Web team, and share ideas, if everyone is working with the same templates and on the same platform. 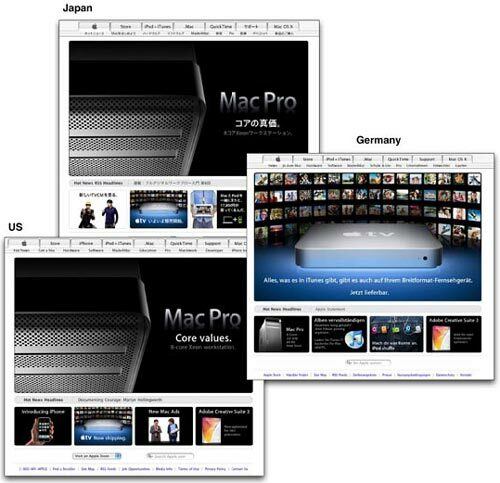 As shown here with Apple, a consistent global template allows the company to more efficiently deploy global promotions. Local offices aren’t required to resize images or redesign layouts. The elements need only be localized. Global design templates are used by all Web sites in the top 10. In fact, nearly half of the Web sites studied for the Report Card either support consistent global templates or are on their way to doing so. Global templates need not restrict local sites from offering their own content. The best global templates generally reflect less design, that is, fewer elements and minimal screen real estate. If there is one key takeaway from this article it is this: If you want to improve your company’s global Web site, look outside of your industry. Web globalization best practices may emerge from anywhere, so it’s always important to study those companies that have done a particularly good job of communicating with the world. 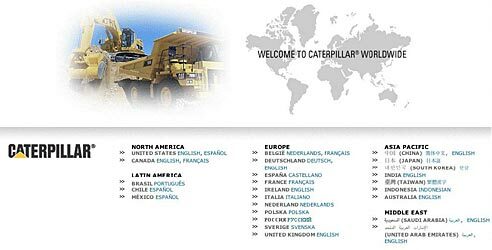 From the splash gateway used by Caterpillar to the geolocation used by Google, by keeping an eye outside of your industry, you’ll be better prepared to stay ahead of the competitors within your industry. This article gives a good insight into Web globalization. However, the example of Apple Site I believe is not true as I checked all the sites but all the local sites were different.